The past couple of nights we have started to go through our typical routine around dinner time. One of us gets Caleb and puts him in high chair. Actually, I think last night he knew it was coming and was actually standing there looking up at it. We put the table on it, serve up out food, and begin to get his ready. And then we look at Caleb and notice him with his hands out, just kinda looking at us, like, "We’re gonna pray now, right mom and dad?" So we all grab hands, and thank God for His provision. Asking God to bless our food, especially when it isn’t healthy is kinda a pet peeve of mine. 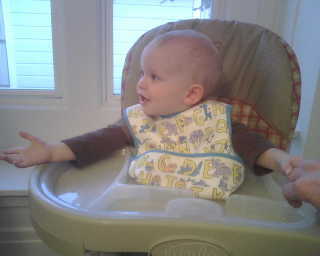 We finish and say "Amen" at which point Caleb blurts out something and pulls his hands in with a big smile on his face. I love that our son is only 17 months old and already reminds us to pray! It’s like looking in a mirror of my life man… Micah does the same exact thing. I love it! Alexa reminds us too. She says Mommy, Dear Jesus?